In this video we use the Dev Desktop application to rapidly set up a web environment and install a Drupal site on Windows. We also review where to find your Drupal file directory and database when you need to back your project up or install new modules and themes. These next videos are to help you setup a web environment in Windows quickly. If you need to set up an environment on OSX or Linux you can safely skip over these. For Windows we're going to use an application called Dev Desktop. Dev Desktop will install and configure the entire amp stack as well as Drupal and will help you manage multiple sites through a single interface. 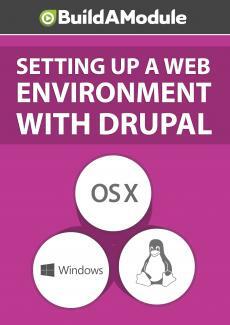 While there are definitely other options for getting a site set up I haven't found anything that's as quick for setting up Drupal. So I'm going to open up a browser and I'll type in download Dev Desktop. I'll go to the top link, which is Acquia dot com slash downloads, and we'll click win download under Acquia Dev Desktop. Once it's downloaded let's run it. I'm going to click yes to the security notification and let's click next. We'll leave the defaults checked and click next. Next again. We'll accept the license agreement, and you can choose whether to keep this checked to send diagnostic information. I'll click next. You can change the location of the installation folder, as well as where the sites will be located by default. I'm going to keep them at their defaults. I'll click next. If you have another web stack installed you may need to adjust these ports, but most of the time you can leave them at their defaults. I'll click next. And next again. Then next to start the installation process. Once that's done let's click finish.